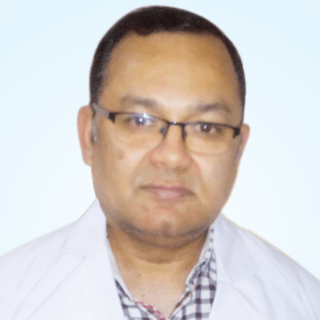 He is the Secretary of UP and Uttrakhand chapter of Indian society of Critical Care Medicine since 2016, and also the VP Indian Society of Anaesthesiologist, Kanpur branch. Observer ship in critical care at University Hospital Dresden – 2012. Observer ship in critical care at University hospital Frankfurt -2002. Observer ship at Free university Hospital Brussels – 2002. M.D | Anaesthesiology – GSVM Medical College Kanpur – 1998. M.B.B.S – GSVM Medical College Kanpur – 1994. Clinical Nutrition in critical care the 4th pillar of treatment. Ventilation in ARDS esp Prone position ventilation. Resuscitation esp focussing on monitoring, fluid responsiveness and vasoactive drugs. Education and orientation of paramedical and support staff. Secretary of UP and Uttrakhand chapter of Indian society of Critical Care Medicine since 2016. Vice president of Kanpur city branch of Indian Society of Anaesthesiologist. Past secretary of Indian society of Anaesthesiologist Kanpur city branch. More than 25 publications in peer reviewed national and international journals. Invited faculty for various state and national level conferences in field of Anaesthesiology and critical care.